We were in Exuma for a week at Sandals Emerald Bay. While the trip was to be a romantic getaway for Valentine’s Day, there was one excursion we didn’t want to miss. A few years before, my friend had rented a boat from Nassau. 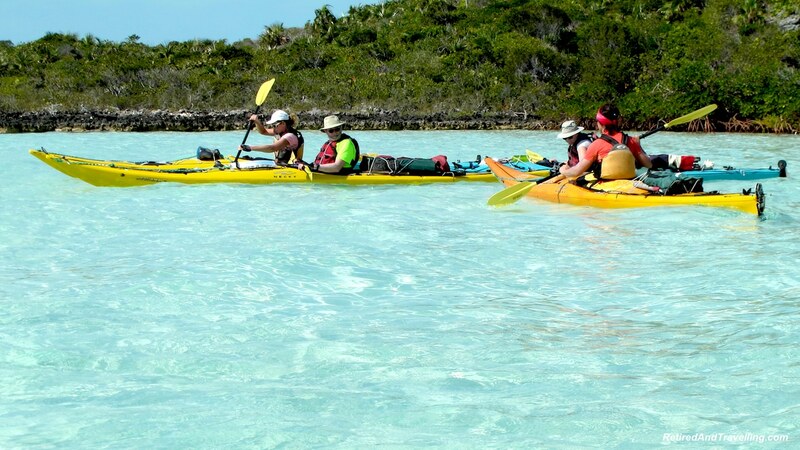 Ten of us headed to Compass Cay in the Exuma Islands to swim with the nurse sharks and to visit the iguana island. That trip had been a great hit with all of the kids – big and small. 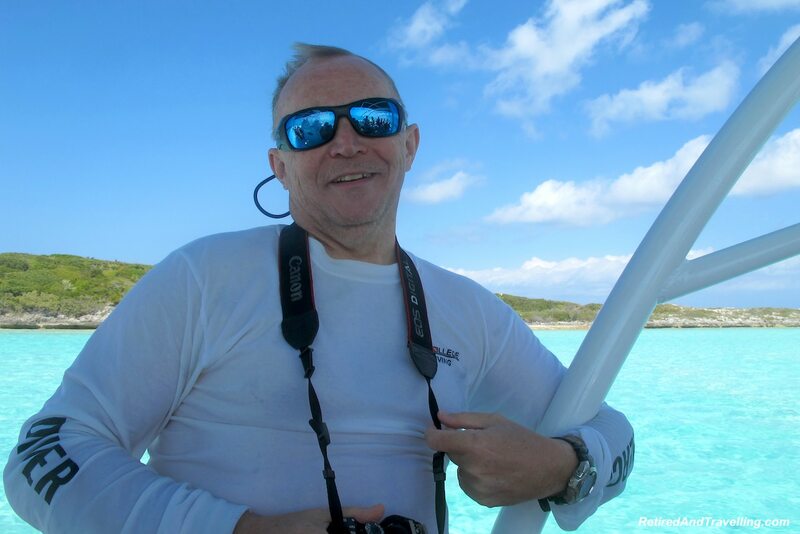 Last year my friend again rented a yacht to travel around the Exuma Islands. 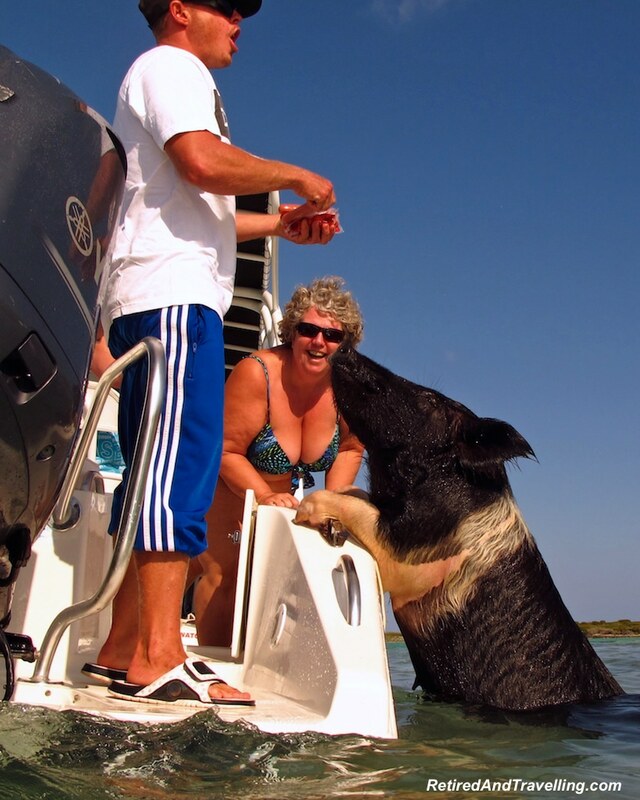 He sailed a bit further to swim with the pigs. His videos were so hilarious! 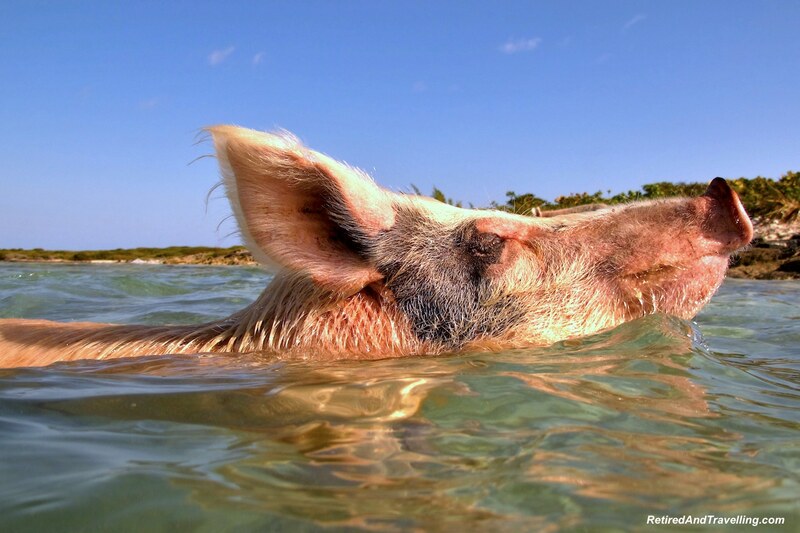 An Exuma swim with pigs excursion to see the swimming pigs (and so much more) would be a high priority! I watched the weather forecast and picked a crystal clear day for our trip. We set the alarm once again (also doing that for scuba diving). We had breakfast and then packed our bags for an 8:30 departure. It was a quick 30 minute trip to Barraterre to meet the tour operator. Justin got the 16 passengers settled and off we raced in the speedboat. I was pleased to find plenty of shade. At the end of the day this was perfect when I was sun soaked. I would pay for days with a sunburn I picked up when snorkelling. But I was glad I was not the roasted people who sat in sun all day long! Along our route Justin stopped regularly to point out things of interest. We saw the old osprey nest , the new osprey nest and the osprey guarding its territory; the Goat Island with the goats all hidden thinking we may be goat hunters; the island houses of the rich and famous; and even a 10 foot tiger shark lurking in a bay. We would zoom up with the boat fully on plane until he saw something. Then he would slow to give his tour guide speech, always open to questions from the guests. At one place, Justin came in close to shore to throw a beer to an island local named Willie. In the “small world” we live in, we met a waiter at Sandals who told us he was Willie’s cousin when we were taking to him about our trip. 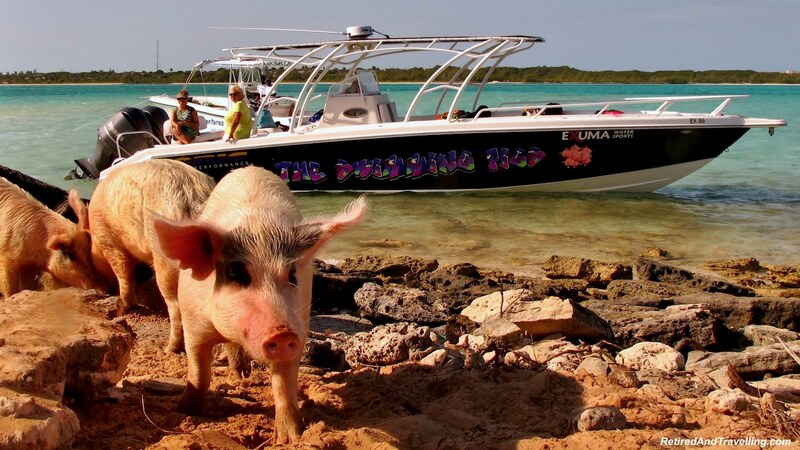 The first stop was the infamous Exuma swim with pigs site. Unfortunately we were the second boat in. So the pigs were much less interested in swimming out to be fed more. A few more aggressive ones did not want to pass up the hot dogs. They almost climbed right on board. While we saw a few swimming, most of the pigs were back on shore, including the babies. Justin and his crew had brought fresh supplies for the pigs. They filled the food and water troughs, including the special pen that the baby pigs could retreat to. It was a great start to our day. The second stop was at a small island that Justin deemed to be the “pool and shower”. A shallow pool on shore presented a perfect picture opportunity with the Atlantic Ocean in the background. The blow hole in the lava rock erupted regularly. It provided a sea and salt shower to anyone brave enough to stand close. Stopping at another island, we saw that a group of 4 kayakers were already on shore. We would be ruin their tranquility. Justin’s dad cut a path that let us walk up to the top of a small hill. 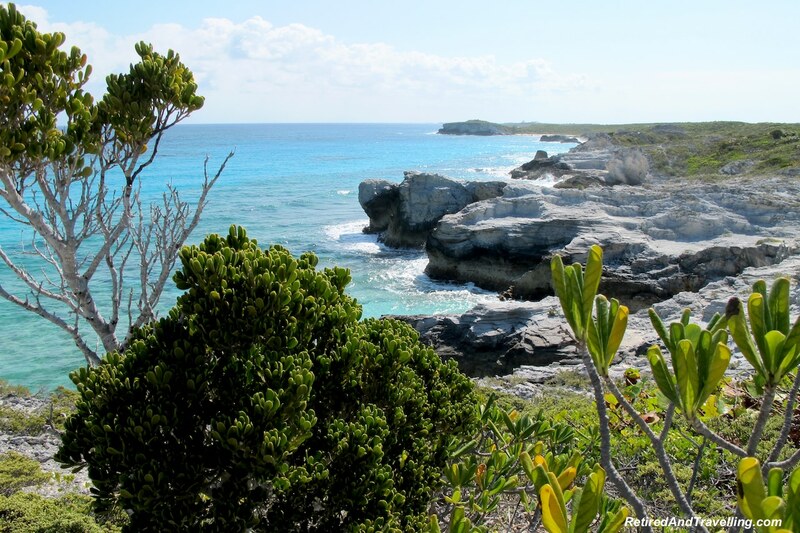 The amazing view of the Exuma waters from the top was worth the scramble up the hill. The iguanas were the next stop. We saw an iguana island before. 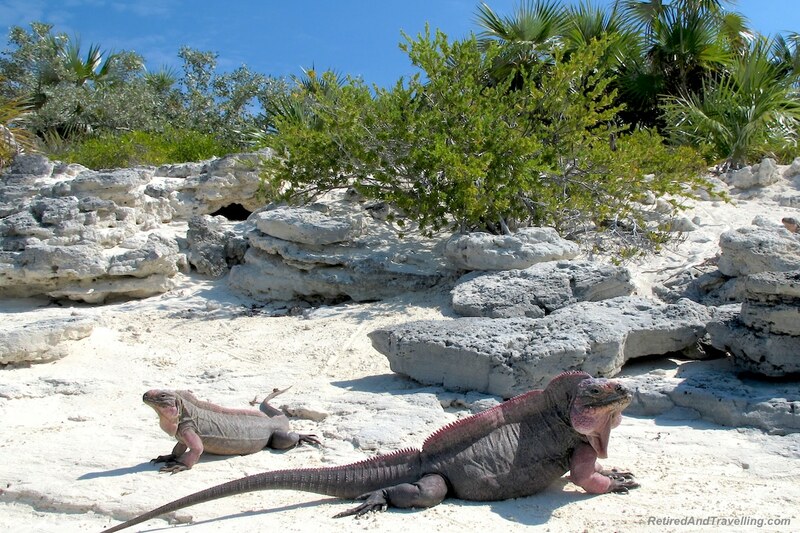 So we were less amazed at the large, friendly iguanas than most of the others were. 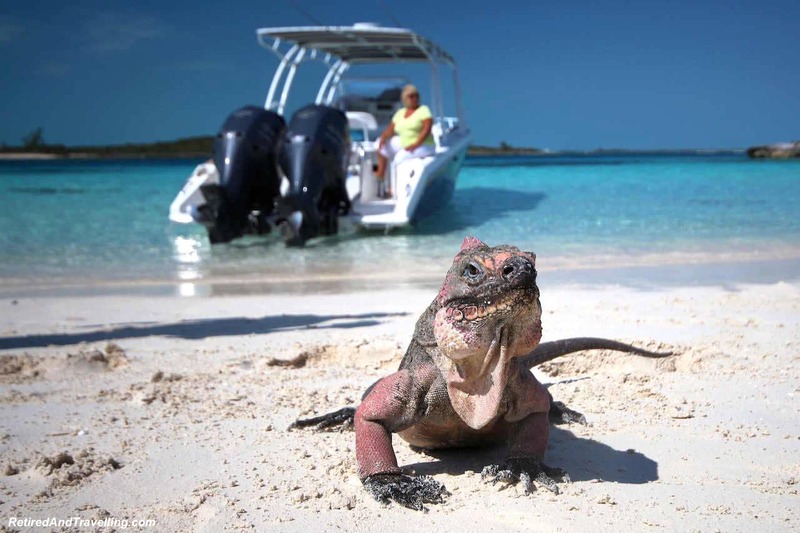 Well trained by stopping boats, the iguanas scampered to us as soon as we landed. They were waiting for the grapes Justin had brought for us to feed them. David never hesitated to lie amongst them to get just the right picture. But I was a little bit less calm. I scurried like a crab backwards when the iguanas seemed to want to nibble on my camera. 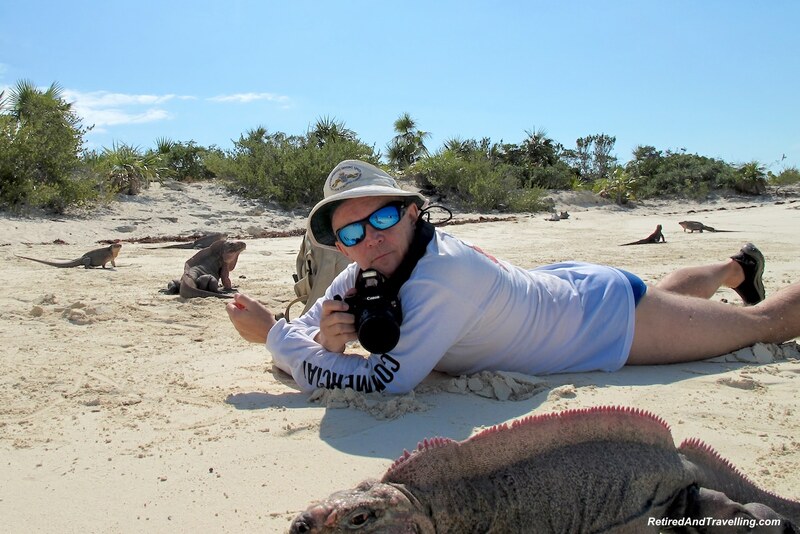 I posed a few times while the iguanas seemed to ham it up for the camera. But I was ever watchful once the iguanas got on the move. As we approached noon, we stopped to snorkel. We were first off the boat. As scuba divers, we were not at all unsure about jumping off the side into deeper waters. There was a fair bit too see if you headed a bit away from the boat. 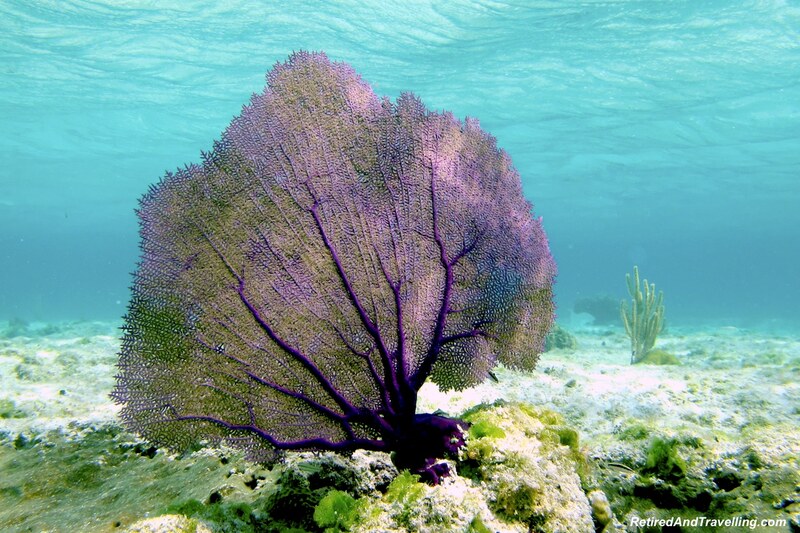 We made sure to get away from the beginners that seemed to have missed the instruction about not stepping on the coral. The waters were a bit clouded from the high winds we had been seeing. But it was definitely worth a slow swim around the bay. 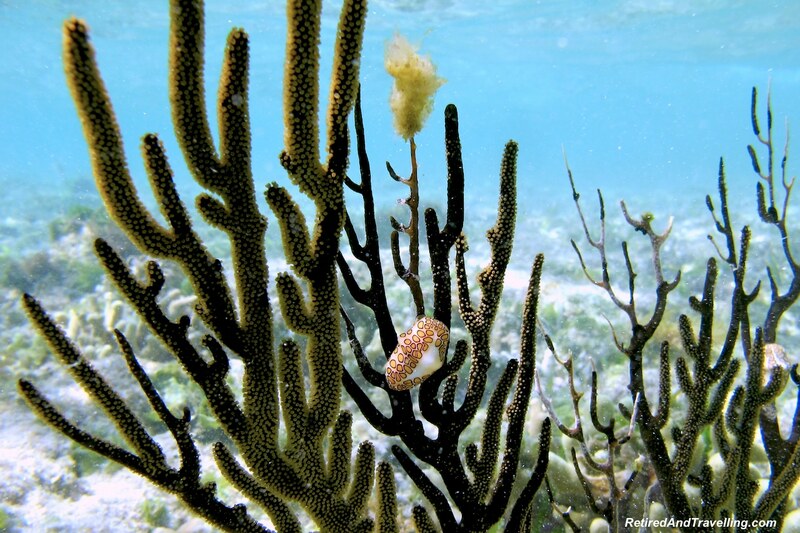 We would see much more when we went scuba diving in Exuma! Our final stop was at a shallow, sandy bay. 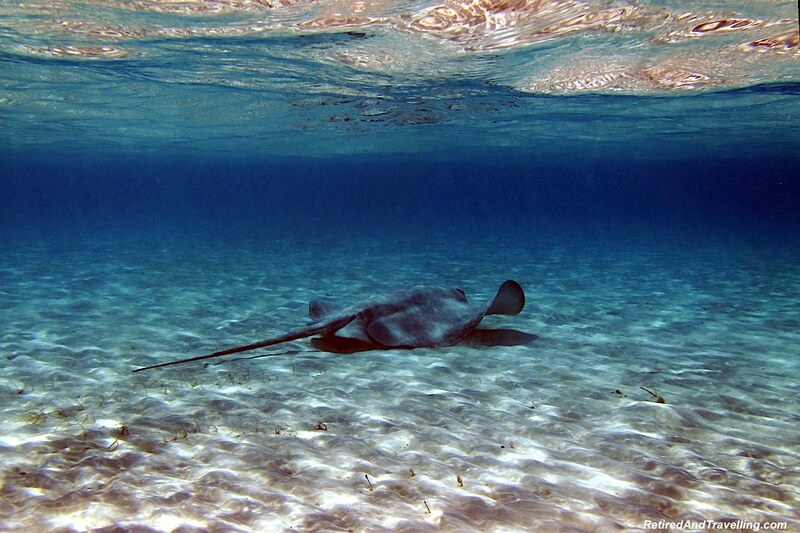 You could see a dozen dark spots under the water on the sand that were stingrays. As soon as we all hopped in the water, the rays moved away. No matter how slow you tried to stalk them, they moved away. Justin tried to feed them hot dogs hoping to make this bay a better stingray attraction over time. It was a short hop back from the last stop. We said goodbye to Justin and his crew. 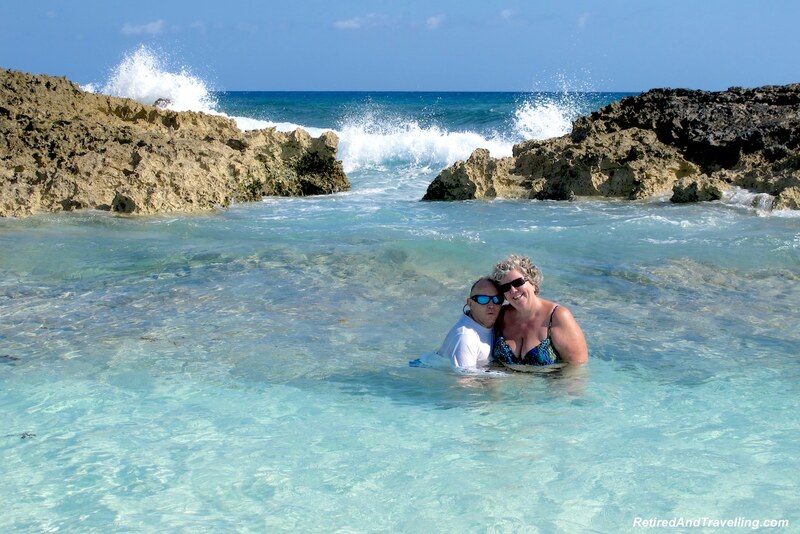 We had a great day seeing swimming pigs, feeding the iguanas, exploring the outer islands and snorkelling in Exuma. Back at the Sandals Emerald Bay resort we were happy to send people on this Exuma swim with pigs tour, even if nobody else got quite the great weather we did on our trip! 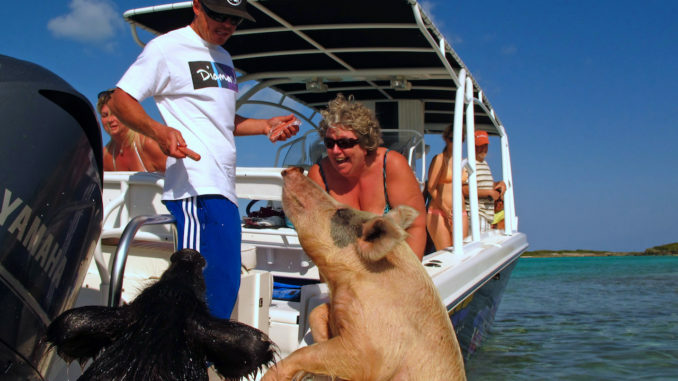 Have you tried this excursion to Exuma swim with pigs? Did we miss anything? That sounds like such an amazing tour!!! I can’t believe how big the pigs are!